I have to eat fruit every day. If I don’t, I wither away psychologically. When I was in New York for a while this winter, it was tough because there weren’t a lot of fruits available. I like apples and pears very much, but local pears had finished and while an apple a day may keep the doctor away, I needed something a little more exciting to keep myself as fit as a fiddle. True, there’s usually citrus bagged up in the grocery stores. But being from California, I hate to be a snob (well, sort of…) but I missed all the lovely oranges, Meyer lemons, and tangerines that burst onto the scene each winter at the markets in San Francisco. And in Paris, we have plenty of clementines, oranges, and occasionally, Sicilian or Menton lemons, to tide us over until spring. Upon my return to Paris, since the citrus fruits at the market were looking passé and punky, there was no rhubarb to be found, and the melons looked and smelled as green as a pine tree, I thought I’d use some of the cranberries that I stockpile in my freezer to make an upside down cake for dessert the other night. 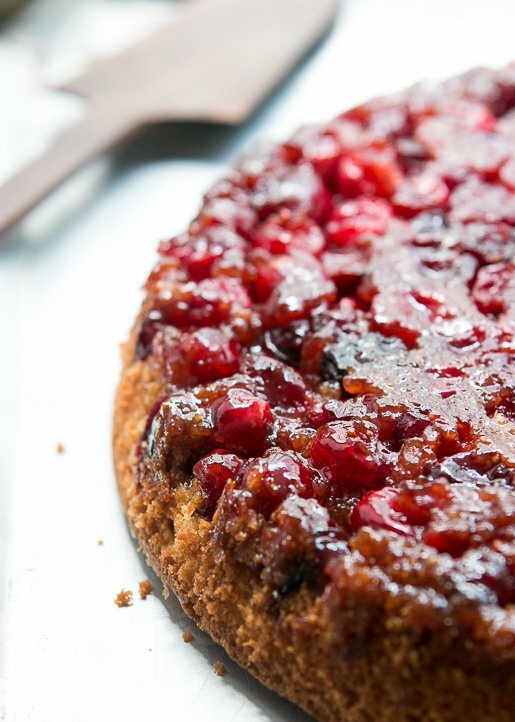 There are lots of kinds of upside down cakes, but the best – in my opinion – use tart fruits and berries, such as cranberries, which are super puckery and are particularly good candidates for melding with a brown sugar and butter topping. 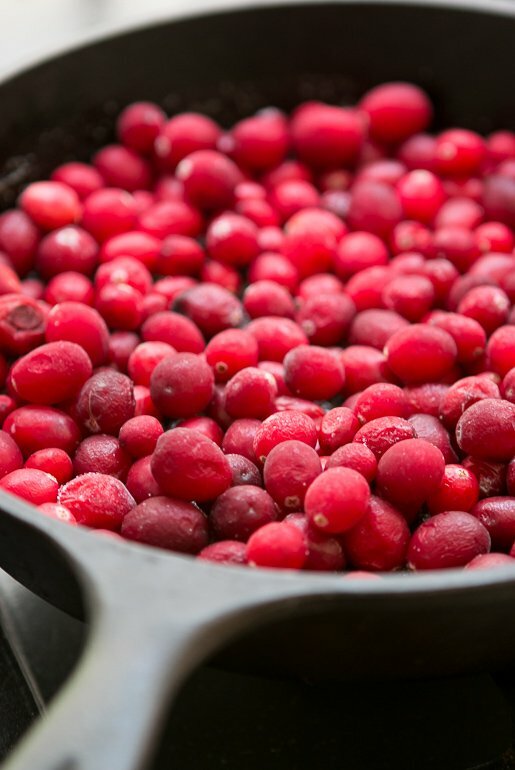 Another bonus is that cranberries need no preparation; you can either dump them right into the pan if they’re fresh, or use them frozen – no need to defrost. One thing I learned from my mentor, Lindsey Shere, who I worked with, and for, at Chez Panisse, is that you don’t need to add all sorts of things to other things; cakes are fine just as they are, you don’t have to necessarily add whipped cream or ice cream or sauce. Just leave ’em alone and let them do their thing. They’ll shine on their own. This is more of a skillet cake, so it’ll be lower than other cakes, which I like better since there is a higher proportion of gooey cranberry topping to buttery cake. I added some cornmeal to the batter since I have a thing for adding a little crunch to cakes and cookies. When you turn out the warm cake, the best part are the sticky-sweet bits that get stuck and left behind in the pan. You can be a good person and use a spoon to reunite them with the top of the cake. Or, since you’re in the privacy of your own kitchen (…and who deserves them more than you? ), you can take care of them yourself, with a spoon. Yes, upside down cakes are best served warm. But fear not, do-aheaders. A few strategies for pre-preparation are at hand. One is to bake the cake timed to come out of the oven an hour or so you plan to serve it. Overturn the cake on a baking sheet or serving platter, but leave the skillet (or cake pan) over it, which will hold in the warmth until it’s time to slice and serve. You can also unmold the cake and rewarm it in a moderate oven, covered with foil, until it’s warmed to your liking. However, I discovered quite by accident, when I needed warm cake in a hurry (you know how that happens – right?) that upside down cake is really good blitzed in a microwave oven, which warms it up nicely. As long as you serve it right away, it won’t dry out. Slices can go in for about 10 seconds on high, or for a whole or half cake, microwave it for as long as it takes to warm it up to your liking. I’m not an expert on microwave ovens and since all are different, you’ll have to be the judge of it. If you don’t want to deal with rewarming, relax and just eat it as is. There’s nothing wrong with that. The purpose of cake isn’t to stress you out. In fact, I like nothing better than relaxing over leftovers, which make excellent breakfast fare, along with your morning coffee. No extra effort required. This cake can also be made in a regular 9-inch (23cm) cake pan, one that is fine to heat on the stovetop if you don’t have a cast iron skillet. 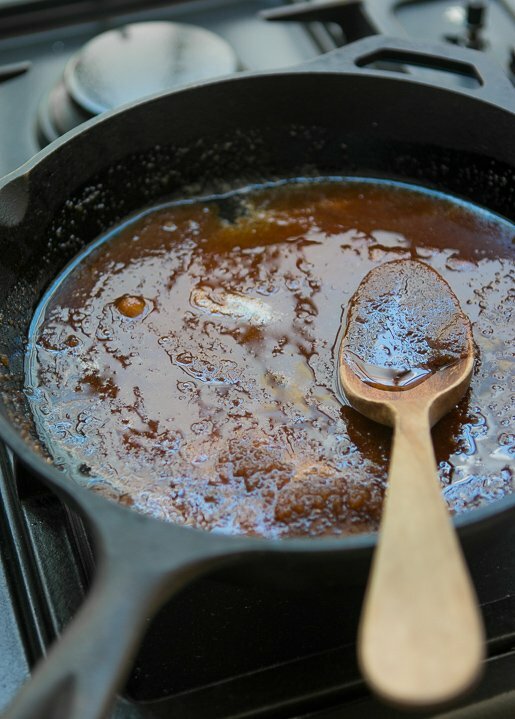 (If you don’t have a regular cake pan that can be put over direct heat, such as a glass or ceramic mold, you can heat the butter and brown sugar in a saucepan and pour it into whatever pan you’re using.) 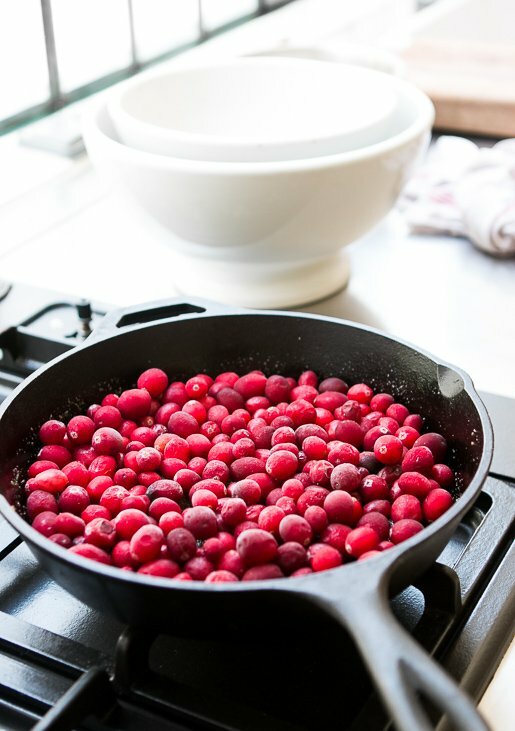 Don’t use a springform pan as the topping will almost certainly leak.If using frozen cranberries, no need to defrost them before using them. If you want to substitute other fruits, just arrange them in a pinwheel or haphazard design over the layer of brown sugar topping in place of the cranberries. If using slices of raw pineapple, sauté it first for a few minutes, until heated through. 1. 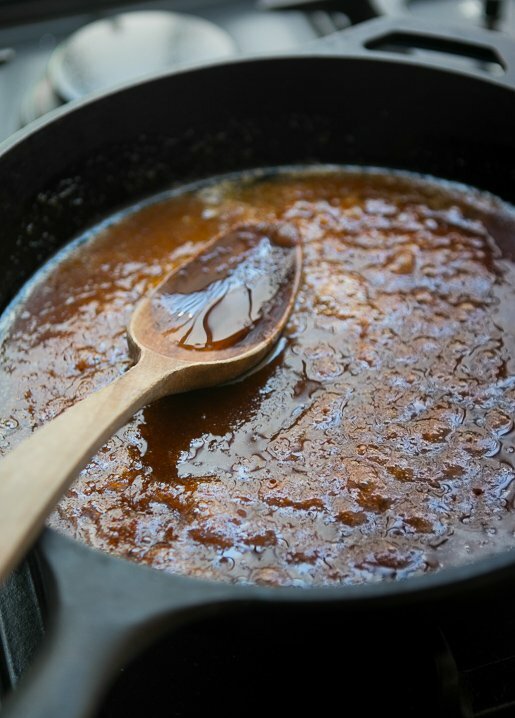 In a 9- to 10-inch (23-25cm) cast iron skillet, melt the 4 tablespoons of butter and the brown sugar together, stirring frequently, until the sugar is moistened and liquefied. When the mixture starts to bubble, remove from heat and set the pan aside. 3. In a small bowl, whisk together the flour, cornmeal or polenta, baking powder, and salt. 4. In the bowl of a stand mixer, or by hand in a mixing bowl with a spatula, beat the ½ cup of butter, granulated sugar and lemon zest at medium high speed for 3 to 5 minutes, until very light and fluffy. 5. Reduce the speed of the mixer to medium and add the eggs one at a time, stopping the mixer to scrape down the sides. Mix in the vanilla extract. 6. At low speed, add half of the flour mixture, then the milk, then the remaining dry ingredients, mixing just enough so that they’re all combined. Do not overmix. 7. Distribute the cranberries in the prepared pan over the brown sugar mixture and shake the pan so they are in a relatively even layer. Spoon the batter over the cranberries in four mounds, then use a spatula to spread the batter evenly over the fruit. 8. Bake the cake until the top is golden brown and a toothpick inserted into the center comes out clean, about 50 minutes. Remove from the oven, wait 10 minutes, then run a knife around the cake. Place a serving platter overturned on top of the cake in the skillet, then using oven mitts to cover your hands, flip the two over simultaneously, until the cake releases from the pan. Storage: The cake is best made and served the same day, warm if possible. To rewarm it, use some of the techniques mentioned in the post. It is also good served at room temperature. This cake isn’t a good candidate for freezing. But if you must, wrap it well and freeze it for up to two months. If using ripe mango, do I have to saute it first too? Thanks. You can use mango slices just as they are. You may want to toss the slices in a bit of lemon or lime juice and let them sit for a while as they are somewhat sweet, and that will give them a nice bit of tart contrast. 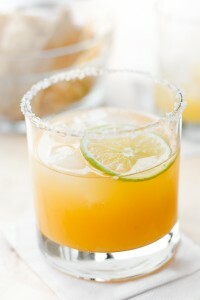 This sounds tart, sweet and delicious in every way! Looks absolutely delish! 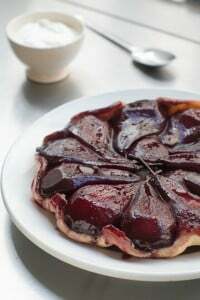 Reminds me of David’s Red Wine Poached Pear Tart, which was a huge hit in my family – I ended up making at at least a dozen times. OOHHH! that does sound and look delicious. I like the addition of the polenta. Do you think I could substitute fresh rhubarb for the cranberries? Somehow I missed the idea of doing this with cranberries, so shame on me. On the other hand, you might enjoy substituting rhubarb, which now lives year around in grocery freezers. It is pastel which looks lovely on a spring table, maybe with apricot color tulips in view? This looks amazing! Can’t wait to try it. As this is my 35th year of teaching French at my school, the Parents Council will present me with a book of my choice. My choice? My Paris Kitchen! I cannot wait to get my hands on it! I gave it to a very good friend for Christmas and we made your soupe à l’oignon, but soon I will have my very own copy. Bon appétit et merci beaucoup! Another great recipe as usual!!! :) could I use something else in place of the cornmeal/polenta though? It sounds fab but I don’t seem to have other uses for them in my pantry so I don’t know if I’ll be running out to get them! Geraldine and janice: You could use diced rhubarb – about 3 cups. 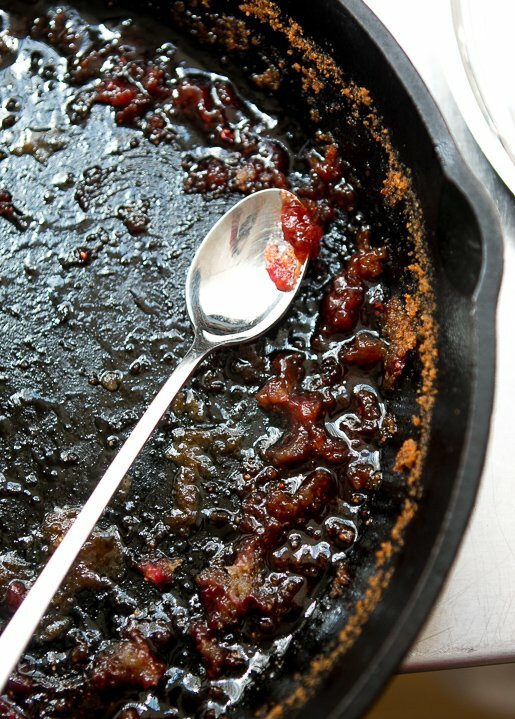 Depending on your tolerance, or how sweet the rhubarb is, you might want to toss the diced rhubarb with a small bit of sugar to take the edge off before putting it in the pan. Charlotte: You can just use flour in place of the cornmeal or polenta. Your blog is a delight to read and the pictures are amazing. The Cranberry Cake sounds marvellous. I purchased a copy of “My Paris Kitchen” and have only read it about 5 times already. Bravo! I live in Vancouver and am sorry I did not get to see you at Barbara-Jo’s but have kept your blog about your visit. Wow, looks really good. Wish I could get cranberries here. Can get mangoes, though. Just a thought, but is it crazy to substitute passion fruit — and if so, any suggestions on how to do this. Thanks. I’m very proud of my apple or pear upside down spice cake with topping made with molasses instead of brown sugar, but must try cranberries or rhubarb!!! BTW,I find if you leave the skillet upside down over the cake for ten minutes before lifting, the to comes out cleaner. a master baker….but there it is. Soooo….the question is : can I substitute olive oil for the butter in this recipe? a good recipe and waste the ingredients. Love your blog. It’s the first one I read. These cakes are wonderful! I have a favorite that uses the sweet/tart dark Italian plums that show up for a few weeks in October. That cake was not intended to be an upside down cake, so fruit was on top and sprinkled with a lot of cinnamon and some sugar. Delish. I used to freeze the plums (they halved neatly) but our freezer is sadly smaller now. Reheating in microwave can be successful if done very judiciously. Our MW is a 1300 power. A couple of 10 second zaps and things are warm. Frozen muffins are even pretty good after three 10 second zaps. But be careful. Breads get tough very quickly if over MW’d. 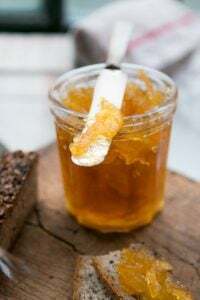 Is there a way to substitute honey into this recipe if you’re not eating sugar?? If so, how would you do that? This reminds me so much of Laurie Colwin’s glorious New England Cranberry Pie from Gourmet Magazine long ago & a favorite in this house for years. She said it was really a cake & not a pie, & needed nothing else to make it sublime. I know she would relish the polenta addition. Can’t wait to try it that way. I’ve also made it with peaches & blueberries. Still Wonderful! Merci for featuring it. Looks lovely David. What kind of flour did you use? Type45. Can you tell me too please,When I was going to try a recipe from USA and they said it was bread flour could i use Type 55 for that here in France. Ina Garten has a similar recipe, tho she calls it a plum ‘tatin’, but it’s really an upside down cake. I’ve made it with so many different fruits, from apples to all the summery ones (peaches, nectarines, plums) and cranberries. They always come out fantastic and there’s something so satisfying about hearing that ‘plop’ when you invert the pan. The only fruit not to use is fresh strawberries. The one time I tried that the pan was awash is so much liquid I could barely get it out of the oven. 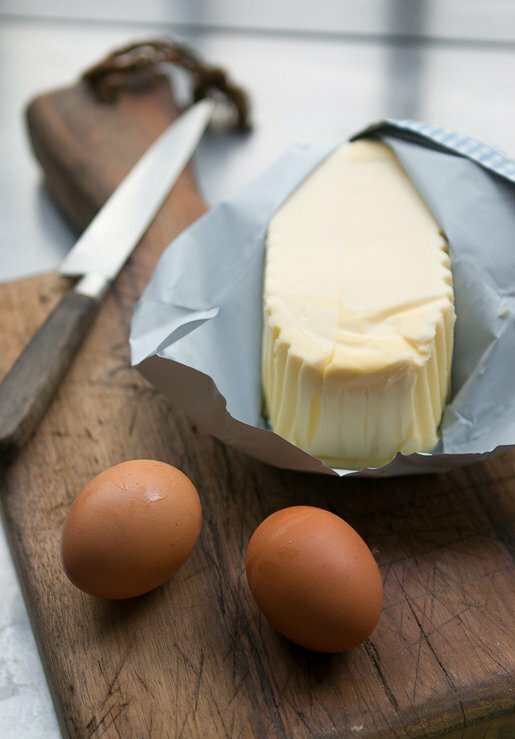 Love the fluted stick of butter. This recipe reads so beautifully, David, and the photos look delicious — all as usual for you — and I’ve sent it to my sister. 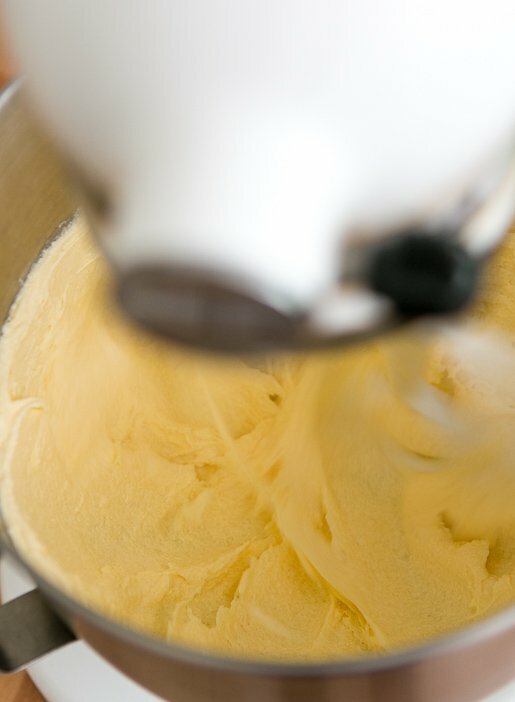 Many baking recipes call for mixers to make butter light and fluffy, or to allow one to integrate dry ingredients without over-mixing. I have an old Cuisinart food processor, but not a mixer. Perhaps you could sometime write about how to use a food processor in lieu of a mixer, for many aspects of baking? Frankly, I cannot afford a $300 mixer…. In this recipe, for example, you write that I could mix the butter, sugar and lemon by hand until light and fluffy, but you write about incorporating the eggs and flour at low-medium speeds in a mixer. BTW, I sent your Paris Kitchen cookbook to my sister who’s a brilliant cook and who loves your Middle Eastern / Mediterranean recipes (we’re Sephardim/Mizrahim). Jennifer: Passion fruit is really liquidy so don’t think it’d make a good topping for this cake. patricia: Check out the post I linked to at the end of the post, about American Baking in Paris. That explains what flour I use. Stephanie: Honey results in very heavy cake batters so I wouldn’t swap it out for sugar in this recipe. Gloria: You’d have to play around with it. Because butter is about 20% water, and oil has none, you can’t just swap one for the other. Love, just love cranberries and add them to salads, sautés of fish/veggies and use dried ones in porridge & as snacks. Love this recipe but wondering if there is a way to reduce the sugar maybe with apple juice & reduce the milk added? Will be using plain Almond milk instead of dairy or could use Vanilla Almond milk and reduce the sugar that way. Never like adding lots of sugar to anything and prefer to substitute. David, thank you so much for giving ingredients in metric. Very much appreciated. Fruit was really bad this year in NYC… Even early spring has been poor. But we are just now getting the cherries and berries coming in from California… even a few good looking apricots! I really like the texture that cornmeal gives in this cake- a nice balance to the gooey topping. This (i.e. 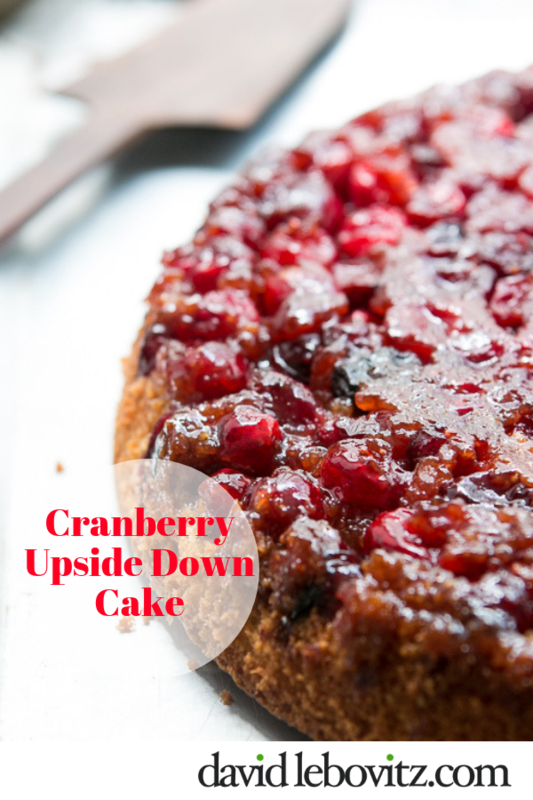 cranberry upside-down cake) has been one of my favorite stand-by company’s coming desserts for years, though I use more cornmeal and less sugar in the cake, and maple syrup in the topping. David, I know that maple syrup is harder to get than illicit drugs (or a day off) where you are, but promise me you’ll try this with maple syrup when you have the chance sometime. I suspect that a floral honey would do very good things, too, but the maple is really quite something. Thank you. This was perfect for my froozen gooseberries (last year’s garden harvest). It was good! David, I don’t know where you find all those cranberries in France. I live 30 kilometers south of Paris and they are are scarce as hen’s teeth here. Every Thanksgiving and Christmas I search to no avail. Enjoy your book and never miss your blog. Your writing style surpasses all others. I’m with you on all counts – daily minimum requirement of fruits, preference for tart fruits, being totally over airplane seats (need I mention airline food?). Sounds like a cake I’d like to try, especially since I’m living in cranberry (and blueberry) country. This was a great recipe. I used a whole (U.S.) bag of cranberries (almost 4 cups) and it turned out great. The cornmeal gives it a nice crunch. Am a bit late to the party but I made this last week. Almost to the letter of the recipe except I used frozen cranberries, replaced the cornmeal with semolina as that was in the cupboard, and jacked up the oven to 200C for the 1st 30 minutes. The result was amazing! Still delicious a week later and I am not a desserty person. What would you recommend I use for the pan, I do not have iron skillet? You can use a regular 9- or 10-inch cake pan, that’s at least 2-inches high – but don’t use a springform pan as those will leak in the oven. Amazingly amazing recipe and so gourmet looking and tasting! Couldn’t find fresh or frozen cranberries, and was hesitant to experiment with dried cranberries, so I used frozen mixed berries- raspberry, black raspberry, and blueberry- and it turned out amazing and not bitter to my surprise. Also added orange zest to the cake batter as well as a teaspoon of cardamom only because I add cardamom to literally everything! Still want to try fresh cranberries! Thank you for sharing great photos of a cake that actually tastes great! Just perfect! 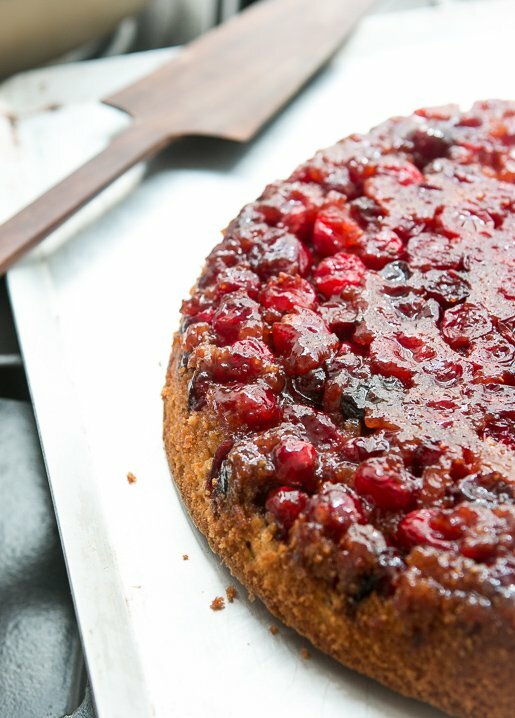 I love that you made this cake when Cranberries weren’t technically in season. I love seasonal fruit, as well, but I am very guilty of using frozen fruit when other fresh fruits are not available for baking. Cornmeal is such a neat addition. I have to try that! Would cherries be an appropriate tart fruit for this recipe?